Catalogue of Organisms: What Value a Sporangium? Regular readers of this site will know that I select the subject of most posts by assigning myself a taxon semi-randomly and then trying to find something to say about it. And sometimes when I spin the wheel, what comes out can be a little obscure. It's time for another entry in "Taxon Names that No-one Uses"! Colony of Dimargaris cristalligena (Dimargaritaceae), from here. As far as I can tell, the name 'Meromycetidae' has been used in the literature once, and once only. In 1998, Tom Cavalier-Smith coined it as a label for a subclass of fungi in his "Revised six-kingdom system of life". Even compared to other fungal classifications current at the time, Cavalier-Smith's system for fungi contained a lot of features that seemed a little odd (Laboulbeniales as trichomycetes?) and most of his novel propositions were to subsequently sink without a trace. The 'Meromycetidae' were intended to be a subgroup of what most other authors of the time would have called the 'zygomycetes'. Zygomycetes, as generally recognised, were mostly microscopic fungi that lack the dikaryotic phase* of more familiar macrofungi such as mushrooms, and lack the flagellated spores of other microscopic fungi. The most familiar zygomycetes are various household moulds. It is now well established, however, that 'zygomycetes' are a non-monophyletic grade within fungal evolution, leading to their dissolution as a formal class though one may still encounter the name being used informally for convenience. *A period in the reproductive life cycle of many fungi where the nuclei from two parents have entered a single cell, but continue to function and divide separately without yet fusing to form a daughter nucleus. 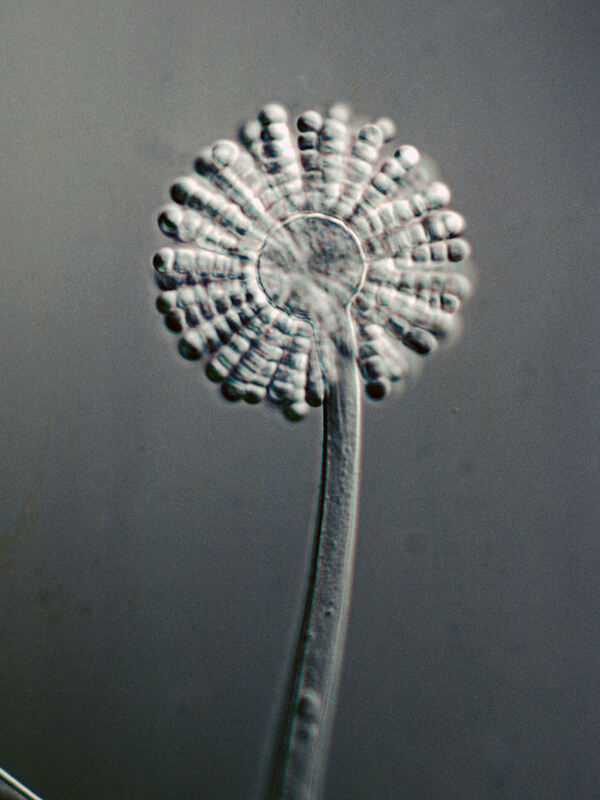 Mature sporangiophore of Syncephalastrum racemosum, showing merosporangia radiating from central vesicle. Copyright George Barron. It is not always easy to tell how Cavalier-Smith's (1998) taxa were supposed to be applied, but it seems evident that the Meromycetidae were intended to cover those zygomycetes that produced merosporangia. Merosporangia are elongate sporangia that may contain one to several asexually-produced spores in series. In a review of fungi with merosporangia, Benjamin (1966) identified four groups that might be described as possessing such structures: Syncephalastrum, Piptocephalidaceae, Kickxellaceae and Dimargaritaceae. 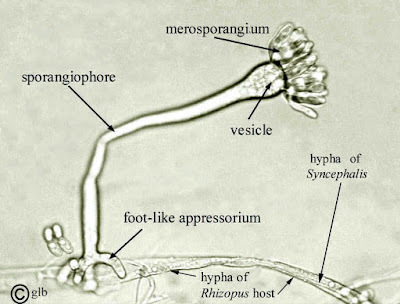 Syncephalastrum and the Kickxellaceae are minute soil saprobes; the Piptocephalidaceae and Dimargaritaceae are parasites of other fungi, mostly of other zygomycetes. However, Bejamin noted that the differences between these groups were such that only the Kickxellaceae and Dimargaritaceae could be considered as likely to be related to each other. 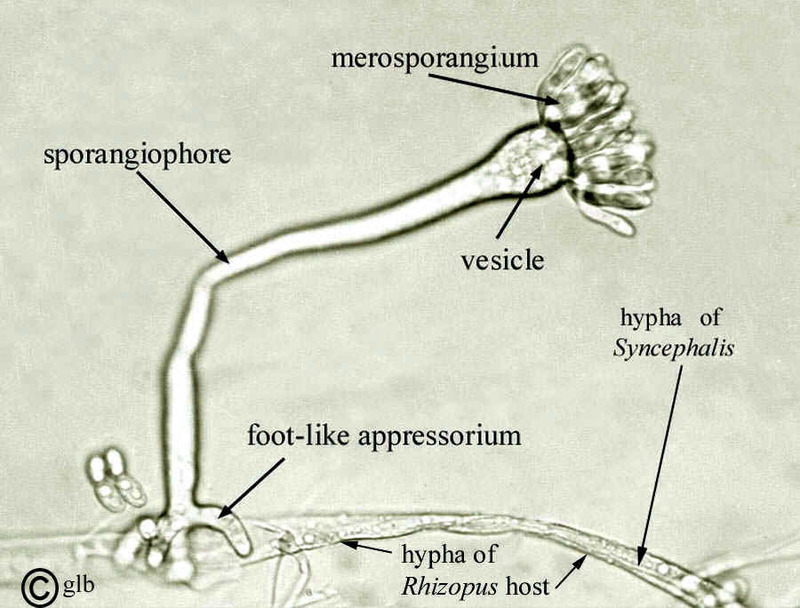 The others differed in features of their hyphal structure, and also in details of how their merosporangia developed. More recent molecular studies have sided with Benjamin rather than with Cavalier-Smith: the production of a merosporangium does not tally with a single ancestry, and the various merosporangium-producing fungi can be placed in quite distinct lineages. Young sporangiophore of Syncephalis nodosa, a representative of the Piptocephalidaceae. Copyright George Barron. Syncephalastrum, for instance, belongs to the Mucorales, in the same fungal order as the house moulds Mucor and Rhizopus. This tallies with the observation by Benjamin that, but for its unusual sporangia, Syncephalastrum could be considered a fairly typical member of that group. The Piptocephalidaceae belong to the Zoopagales, other members of which are also parasites or predators, attacking minute animals such as nematodes or protozoa such as amoebae. 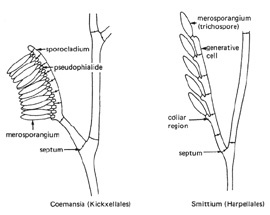 Comparative diagrams of sporangiophores of Coemansia (Kickxellaceae) and Smittium (Harpellales), showing similarities in overall structure, from Moss & Young (1978). The Kickxellaceae and Dimargaritaceae together belong to a recently recognised fungal group dubbed the Kickxellomycotina, all members of which share a hyphal structure that is unique among fungi. Whereas other 'zygomycetes' have the hyphae more or less coenocytic (without regular division into cells), Kickxellomycotina have the hyphae divided by regular septa. The septa each contain a disciform pore that is sealed by a lenticular plug. This group also includes two other orders of fungi, the Harpellales and Asellariales, that have been referred to in the past as the trichomycetes. Members of these two orders are symbionts in the guts of arthropods, usually in aquatic or damp habitats. 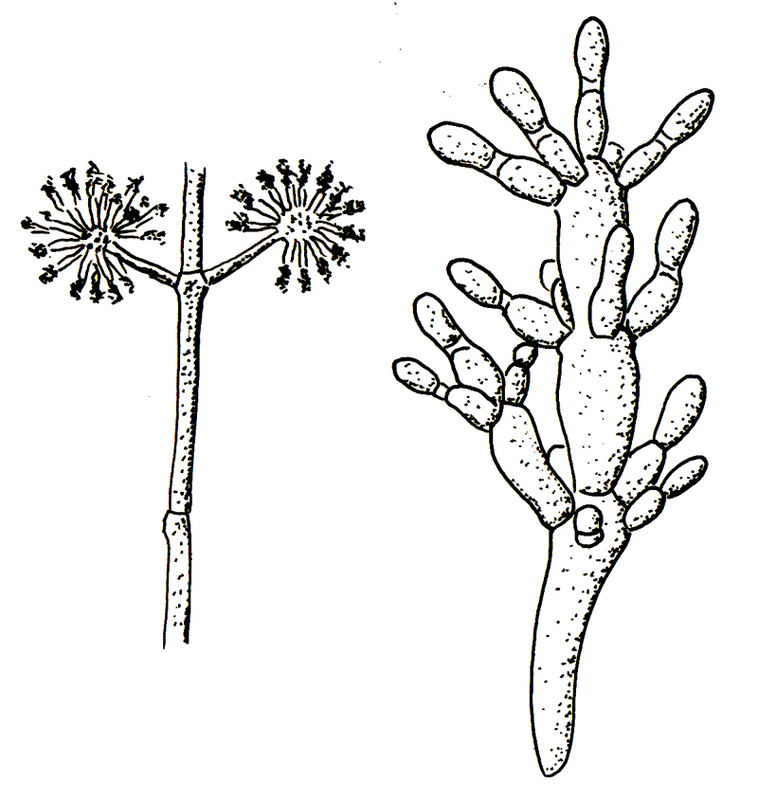 Their reproductive structures are very similar to those of Kickxellaceae, with single-spored sporangia developing as side branches of a septate sporangiophore. Indeed, if Kickxellaceae are to be described as producing merosporangia, then Harpellales and Asellariales should as well. Molecular phylogenetic analyses also support a close relationship between these three groups to the exclusion of the more distinctive Dimargaritaceae (Tretter et al. 2014). 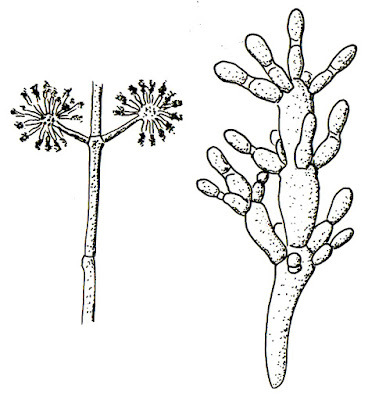 Diagrams of sporangiophores and merosporangia of Dimargaris arida (Dimargaritaceae), from here. The higher relationships of the various 'zygomycete' subgroups are still being investigated. 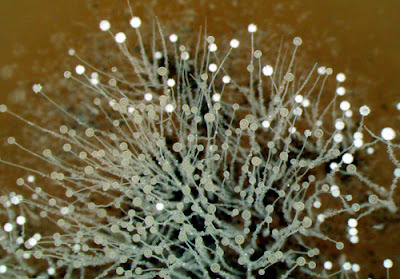 It is fairly well established at this point that no close relationship exists between Syncephalastrum in the Mucorales and the other merosporangial fungi. A number of analyses, on the other hand, have suggested some sort of relationship between the Kickxellomycotina and the Zoopagales, but so far only with low support. Because the organisms involved are so derived, and have possible undergone fairly rapid rates of evolution, mycologists have been reluctant to read too much into these analyses, and new hypotheses may be yet to come. Benjamin, R. K. 1966. The merosporangium. Mycologia 58 (1): 1–42. Cavalier-Smith, T. 1998. A revised six-kingdom system of life. Biological Reviews 73: 203–208. Tretter, E. D., E. M. Johnson, G. L. Benny, R. W. Lichtwardt, Y. Wang, P. Kandel, S. J. Novak, J. F. Smith & M. M. White. 2014. An eight-gene molecular phylogeny of the Kickxellomycotina, including the first phylogenetic placement of Asellariales. Mycologia 106 (5): 912–935. What does it mean for a fungus to be a predator? Presumably it doesn't run around and jump at prey. They're predators in the same sort of way as 'carnivorous' plants. In the case of predatory Zoopagales, they have sticky mycelia that micro-organisms get stuck to. Another more famous group of predatory fungi, in the ascomycete order Orbiliales, have ring-shaped structures in their hyphae that clamp shut on nematodes swimming through them.